Weighing just two ounces, this durable, self-contained unit delivers an accurate pulserate and blood oximetry in just seconds. Auto on/off. 1 year warranty. Oxygen Saturation: 0 to 100%. 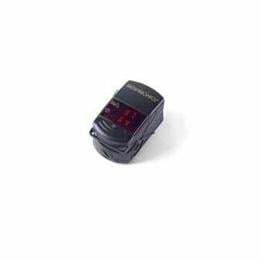 Pulses Per Minute Displays: 3-color Perfusion LED 2-digit LED Displays for SpO2 and Pulse Rate Oximetry. Heart Rate Accuracy: 3% 1 digit Alarms(Alkaline, NiCad or NIMH).